Jean-Michel André Jarre (French: [ʒɑ̃ miʃɛl ɑ̃dʁe ʒaʁ]; born 24 August 1948) is a French composer, performer and record producer. He is a pioneer in the electronic, ambient and new-age genres, and known for organising outdoor spectacles featuring his music, vast laser displays and fireworks. His first mainstream success was the 1976 album Oxygène. Recorded in a makeshift studio at his home, the album sold an estimated 12 million copies. Oxygène was followed in 1978 by Équinoxe, and in 1979, Jarre performed to a record-breaking audience of more than a million people at the Place de la Concorde, a record he has since broken three times. More albums were to follow, but his 1979 concert served as a blueprint for his future performances around the world. Several of his albums have been released to coincide with large-scale outdoor events, and he is now perhaps as well known as a performer as he is as a musician. 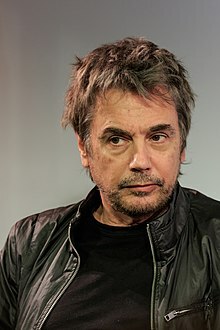 Jean-Michel Jarre was born in Lyon on 24 August 1948, to Francette Pejot, a French Resistance member and concentration camp survivor, and composer Maurice Jarre. When Jarre was five, his parents separated and his father moved to the United States, leaving him with his mother. He did not see his father again until reaching the age of 18. For the first eight years of his life, Jarre spent six months each year at his maternal grandparents' flat on the Cours de Verdun, in the Perrache district of Lyon. Jarre's grandfather was an oboe player, engineer and inventor, designing an early audio mixer used at Radio Lyon. He also gave Jean-Michel his first tape recorder. From his vantage point high above the pavement, the young Jarre was able to observe street performers at work, an experience he later cited as proving influential on his art. This is where Stravinsky created it in 1913, and it was a huge shock. I also saw the last concert by the great Arabic singer Om Khalsoum. She is the goddess, the Maria Callas of the Orient. Then I heard "Georgia on My Mind" by Ray Charles, and I realised that music can talk to your tummy. I was so impressed by the organic sensuality coming from Ray Charles's music – there was no intellectual process and it was great. As a young man Jarre earned money by selling his paintings, exhibiting some of his works at the Lyon Gallery – L'Œil écoute, and by playing in a band called Mystère IV. While he studied at the Lycée Michelet, his mother arranged for him to take lessons in harmony, counterpoint and fugue with Jeannine Rueff of the Conservatoire de Paris. In 1967 he played guitar in a band called The Dustbins, who appear in the film Des garçons et des filles [fr]. He mixed instruments including the electric guitar and the flute with tape effects and other sounds. More experimentation followed in 1968, when he began to use tape loops, radios and other electronic devices, but joining the Groupe de Recherches Musicales (GRM) in 1969, then under the direction of Pierre Schaeffer ("father" of musique concrète), proved hugely influential. Jarre was introduced to the Moog modular synthesizer and spent time working at the studio of influential German composer Karlheinz Stockhausen in Cologne. Jarre's 1969 release, "La Cage"
In the kitchen of his flat on Rue de la Trémoille, near the Champs-Élysées, Jarre set up a small recording studio. It included his first synthesiser, an EMS VCS 3, and an EMS Synthi AKS, each linked to Revox tape machines. For a 1969 exposition at the Maison de la Culture (Cultural House) in Reims, Jarre wrote the five-minute song "Happiness Is a Sad Song". His first commercial release was La Cage/Erosmachine, a mixture of harmony, tape effects and synthesisers in 1969. In 1971 Jarre was commissioned by choreographer Norbert Schmucki to perform a ballet called AOR (in Hebrew, "the light"), at the Palais Garnier. He also composed music for ballet, theatre, advertisements and television programs, as well as music and lyrics for artists like Patrick Juvet and Christophe. Jarre composed the soundtrack for Les Granges Brûlées and in 1972 wrote music for the International Festival of Magic. That year he also released his first solo album, Deserted Palace, and from 1973–74 wrote music for Françoise Hardy and Gérard Lenorman, and wrote lyrics for Christophe and directed Christophe's Olympia show. Jarre's 1976 low-budget solo album Oxygène, recorded at his home studio, made him famous internationally. It comprises six numbered synthesiser tracks that make strong use of melody, rather than rhythm or dissonance. A Scully eight-track recorder was used to record instruments like the Eminent 310 (with an Electro-Harmonix Small Stone phaser on its string pads) and the Korg Minipops drum machine. Liberal use of echo was used on the various sound effects generated by the VCS3 synthesiser. Jarre's ARP 2600 synthesiser, previously used on his collaborations with Christophe, also featured, as did his EMS VCS 3. Oxygène initially proved difficult to sell. Jarre was turned down by several record companies, until another of Schaeffer's students, Hélène Dreyfus, persuaded her husband to publish the album on his label, Disques Motors. The first pressing of 50,000 copies was promoted through hi-fi shops, clubs and discos, and by April 1977 had sold 70,000 copies in France. When interviewed in Billboard magazine, Dreyfus's director Stanislas Witold said, "In a sense we're putting most of our bets on Jean-Michel Jarre. He is quite exceptional and we're sure that by 1980 he will be recognised worldwide." Oxygène has since sold an estimated 12 million copies, the best-selling French record of all time. It reached number 2 in the UK. It also contains his most recognisable single, "Oxygène IV", which reached number 4 in the UK single charts. Jarre's follow-up album, Équinoxe, was released in 1978. It was composed with sequencers, particularly on the bass, and features a more baroque and classical style than Oxygène, with more emphasis on melodic development. Though its sales were still healthy, it had less of an impact than Oxygène, but the following year Jarre held a large open-air concert on Bastille Day, at the Place de la Concorde. The free outdoor event set a world record for the largest number of spectators ever at an open-air concert, drawing more than 1 million spectators. Although it was not the first time he had performed in concert (Jarre had already played at the Paris Opera Ballet), the 40 minute-long event, which used projections of light, images and fireworks, served as a blueprint for Jarre's future concerts. Its popularity helped create a surge in sales—a further 800,000 records were sold between 14 July and 31 August 1979—and introduced the Frenchman to Francis Rimbert, who worked for Jarre during two decades on a full-time basis. By the time Les Chants Magnétiques was released on 20 May 1981, Oxygène and Équinoxe had achieved global sales of about 6 million units. In its first two months the new album sold a reported 200,000 units in France alone. The album uses sounds from the Fairlight CMI, a new instrument of which Jarre was an early pioneer. Its digital technology allowed him to continue his earlier sonic experimentation in new ways. The album's release coincided with Jarre's first foreign tour. In 1981 the British Embassy gave Radio Beijing copies of Oxygène and Équinoxe, which became the first pieces of foreign music to be played on Chinese national radio in decades. The Republic invited Jarre to become the first western musician to play there, with Les Concerts en Chine. The performances were scheduled to run from 18 October to 5 November 1981. The first, in Beijing, was initially attended mostly by officials, but before the concert began technicians realised that not enough power was available to supply the stage and auditorium. Chinese officials solved the problem by temporarily cutting power to the surrounding districts. The stadium was almost full when the concert began, but as Beijing's buses stopped running at about 10 o'clock, about half the audience left before it finished. To boost the audience attendance for the second night, Jarre and his production team purchased some of the concert tickets and gave them to children on the streets (Jarre originally wanted the concerts to be free, but the Chinese authorities decided to charge between £0.20 and £0.50 per ticket). The event was notable for its lack of audience involvement; the Chinese were apparently unmoved by both the music and the light show, and applause was muted. At the second venue, Shanghai, Jarre encouraged audience participation by stepping into the crowd, which became much more exuberant than that in Beijing. Recordings of the concerts, which featured one of Jarre's signature electronic instruments, the laser harp, were released as a double-disc LP in 1982. Musique pour Supermarché was created for a planned performance at the "Supermarché" art exhibition. Jarre allowed Radio Luxembourg to broadcast it uninterrupted, in its entirety, before he auctioned off a single vinyl print on 5 July 1983, at the Hôtel Drouot in Paris. The sale raised about 70,000 francs, and in protest at the "silly industrialisation of music", Jarre promised to burn the original tapes in the presence of a bailiff. Parts of the destroyed album were reworked into works in subsequent releases (including Diva and Blah Blah Café from Zoolook, and sections of the Fifth Rendez-Vous). Both Music for Supermarkets and Zoolook made heavy use of the Fairlight CMI's ability to sample audio. Zoolook features snippets of words and speech from languages across the globe. Laurie Anderson provided the vocals for the track "Diva". A long list of musicians, including Adrian Belew and Marcus Miller, also made significant contributions. The album was somewhat less successful than Jarre's previous works, reaching only number 47 in the UK album charts. I've always been involved in ethnic music, though I thought the way a lot of people have been using ethnic music was a little superficial. Sometimes it works, like the Brian Eno stuff, it worked the first time, but for me what was more interesting was not making a particular statement about recording in Africa or in China, but taking some sounds and having exactly the same attitude as when you were in front of a Moog 55 or a modular system, replacing the oscillators with a bank of actors or people, treating them through the Fairlight or the EMS synth, and establishing an orchestration using only voices. In 1985, Jarre was invited by the musical director of the Houston Grand Opera to perform a concert celebrating Texas's 150th anniversary on 5 April 1986. Although he was busy with other projects and was at first unimpressed by the proposal, on a later visit to the city, he was immediately impressed by the visual grandeur of the city's skyline and agreed to perform. Also, 1985 marked the 25th anniversary of the foundation of the Lyndon B. Johnson Space Center; and NASA asked Jarre to integrate the anniversary into the concert. I remember just before take-off, Ron calling me in Paris saying "Everything's ready, see you in a week's time, watch me on television for the take-off" ... I will really, keep always, the bit of Ron's smile and Ron's face in my heart. About 2,000 projectors shone images onto buildings and giant screens up to 1,200 feet (370 m) high, transforming the city's skyscrapers into spectacular backdrops for an elaborate display of fireworks and lasers. Rendez-vous Houston entered the Guinness Book of Records for its audience of over 1.5 million, beating his earlier record, set in 1979. The display was so impressive that a nearby freeway was blocked by passing vehicles, forcing the authorities to close it for the duration of the concert. Several months later he performed to an audience of about a million at his home city of Lyon, in celebration of a visit by Pope John Paul II. Watching from Lyon Cathedral, the Pope began the concert with a good-night blessing, a recording of which appears on Cities in Concert – Houston/Lyon. In 1988 Jarre released Revolutions. The album spans several genres, including symphonic industrial, Arabian inspired, light guitar pop and ethnic electro jazz. A two-hour concert called Destination Docklands was planned for September 1988, to be held at the Royal Victoria Dock in east London. Close to the heart of London, the location was chosen in part for its desolate environment, but also because Jarre thought the architecture was ideally suited for his music. Early in 1988 Jarre met with local officials and members of the community, but Newham Borough Council expressed their fears about the event's safety and delayed their decision on whether to allow the concert to proceed until 12 September eventually rejecting the licence application. The local fire service were also concerned about access in the event of a fire. Site work continued as Jarre's team searched for alternative locations in which to stage the concert, but following improvements to both on and off-site safety Jarre eventually won conditional approval on 28 September to stage two separate performances, on the 8 and 9 October. The floating stage on which Jarre and his musicians performed was built on top of four large barges. Large purpose-built display screens were built, and one of the buildings to be used as a backdrop was painted white. One large mirror ball being transported to the event fell onto the roadside, causing a degree of confusion as some people mistook it for a fallen satellite. World War II searchlights were installed, to illuminate the sky and surrounding architecture. Along with thousands in the surrounding streets and parks, 200,000 people watched Jarre and guests such as guitarist Hank Marvin perform in less than ideal conditions. Inclement weather had threatened to break the stage from its moorings, putting paid to the original plan to float the stage across the Royal Victoria Dock. Wind speeds were so high that television cameras were blown over. On the second evening the audience, which included Diana, Princess of Wales, was soaked by rain and wind. In 1990 Jarre released En Attendant Cousteau (Waiting for Cousteau), inspired by the French oceanographer Jacques-Yves Cousteau. On Bastille Day 1990 he performed a concert at La Défense in Paris, attended by a record-breaking audience of about two million people, again beating his earlier world record. He later promoted a concert near the Pyramids of Teotihuacan in Mexico, to be held during the solar eclipse of 11 July 1991. However, with only weeks to go, important equipment had not arrived and the sinking in the Atlantic Ocean of a cargo ship containing the purpose-built pyramidal stage and other technical equipment made staging the concert impossible. Jarre's disappointment was such that he "could not cope with Mexican food for two years". About two years later he released Chronologie, an album influenced by the techno-music scene. From a technical standpoint, the album is a reversion to a concept seen in Jarre's Oxygène/Équinoxe period, where a grandiose overture precedes more rhythmic sections. The album features Jarre's traditional collection of instruments like the ARP 2600 and Minimoog, as well as newer synthesisers such as the Roland JD-800 and the Kurzweil K2000. The opening few moments of "Chronologie Part 4"
In the state of mind I did Chronologie, it's quite close to what I did for Oxygène, using a lot of the old synthesizers of the '70s, like the Moog synthesizer — which I consider to be the Stradivarius of electronic music — mixed with the digital sound and the beat of the dance scene of the '90s. In a sense, Chronologie is a kind of mixture between the sounds of the '70s and the sounds of the '90s. Jarre was invited to the inaugural celebrations of the Palace of the Lost City, a hotel located within the Sun City resort in South Africa. Three concerts were held on December 1, 2 and 3 1992. Each concert was attended by 15,000 people. Chronologie was performed at a series of 16 performances across Europe called Europe in Concert. 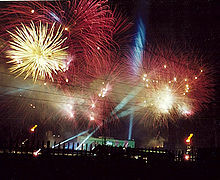 These were on a smaller scale than his previous concerts, featuring a miniature skyline, laser imaging and fireworks. Locations included Lausanne, Mont St Michel, London, Manchester, Barcelona, Seville and the Versailles Palace near Paris. A concert was also held in Hong Kong in March 1994, to mark the opening of the city's new stadium. Jarre performed many of his most well-known hits at the Concert for Tolerance on Bastille Day in 1995, celebrating the 50th anniversary of the United Nations. The Eiffel Tower was specially lit for the occasion, prompting the installation of a more permanent display. The following December, he created the website "A Space for Tolerance", which featured music from En Attendant Cousteau, played while the user browsed a variety of "visual worlds". The excitement of being able to work on sounds in a tactile, manual, almost sensual way is what drew me to electronic music in the first place ... The lack of limitations is very dangerous. It is like the difference for a painter of getting four tubes with four main colours or being in front of a computer with two million colours. You have to scan the two million colours and when you arrive to the last one you have obviously forgotten the first one. In the Eighties we became archivists and everything became rather cold as a result. In September that year he set his fourth record for the largest-ever outdoor-concert audience with a performance at the Moscow State University, celebrating the 850th anniversary of Moscow. The event was viewed by an audience of about 3.5 million. The Funeral of Diana, Princess of Wales, had taken place on the same day, and the Frenchman therefore dedicated "Souvenir of China" to her memory, before observing a minute's silence. Another large-scale concert followed on 31 December 1999, in the Egyptian desert near Giza. The Twelve Dreams of the Sun celebrated the new millennium and offered a preview of his next album, Métamorphoses. The show featured performances from more than 1,000 local artists and musicians, and was based on ancient Egyptian mythology about the journey of the sun and its effect upon humanity. Jarre released his first vocal album, Métamorphoses, in 2000. It was mixed on an early version of Pro Tools, a digital audio workstation designed to record, edit and play back digital audio. Métamorphoses marked a departure from Jarre's earlier work. Sound effects used include radio interference from mobile phones, and Macintalk, a Macintosh program used to generate lyrics on the track "Love, Love, Love". Contributors included Laurie Anderson, who had also appeared on Zoolook, Natacha Atlas and Sharon Corr. Looking back, I enjoyed the album, [Oxygène 7–13] but after I finished it I knew that I had to make a fresh start. I had to go somewhere completely different. Metamorphoses is like a blank page for me, a new beginning. It was followed in 2001 by Interior Music, created for use by the audio-visual company Bang & Olufsen, and which did not receive a commercial release. The same year he composed, with Francis Rimbert arrangements, the music for the short-lived French channel Match TV, and contributed music to the soundtrack of the film Who wants to be a Star. In 2002 he released Sessions 2000, a set of experimental synth-jazz pieces distinct from his previous work. Sessions was well received by Billboard Magazine, which said "He's created a deeply nuanced soundscape that invites repeated listening." A concert in September 2002 at a wind farm near Aalborg in Denmark proved problematic when 22mm of rain fell on the venue, causing long delays for spectators. It also marked a change in direction in Jarre's live concerts; from Rendez-vous Houston onwards he had been accompanied by a full complement of live musicians, but at Aalborg he was accompanied only by Francis Rimbert, and having guests like the Klarup Girls Choir, Safri Duo and the Aalborg Symphonic Orchestra. In 2003 he released Geometry of Love, commissioned by Jean-Roch as a soundtrack for his 'V.I.P. Room' nightclub in France. It contains a mix of 'electro-chill' music, with touches of his more traditional style. In October 2004 he returned to China to open its "Year of France" cultural exchange. Jarre gave two performances, the first at the Meridian Gate of the Forbidden City, and the second in Tiananmen Square. More than 15,000 spectators watched the concert at the Meridian Gate, and each concert was transmitted nationwide on live television. Jarre collaborated with musician Chen Lin. Accompanying his traditional musical repertoire, 600 projectors shone coloured light and images across various screens and objects. In September 2004, Jarre released AERO, both a DVD and a CD in one package. Purportedly the world's first album released for 5.1 systems, with it being fully "constructed" in 5.1 surround sound, it contains re-recorded versions of some of his most famous tracks, including tracks from Oxygène and Équinoxe. Accompanying the audio, the DVD features a visual image of Anne Parillaud's eyes, recorded in real time as she listened to the album. Jarre used the minimalist imagery to reinforce the audio content of the DVD. The CD was mixed in super-stereo. In his role of UNESCO Goodwill Ambassador, Jarre performed a concert named Water for Life in Morocco, on 16 December 2006, to celebrate the United Nations Year of Desertification in the world. The performance was in front of the Erg Chebbi Dunes of Merzouga, in the Sahara. A free event, it was attended by about 25,000 people. Images of water and the environment were projected onto nine vertical screens, held in place by sand which was watered to keep it hard. Several permanent drinking fountains were built on the site, along with a permanent electricity installation. Jarre was accompanied by over 60 Moroccan artists. Jarre released Téo & Téa on 26 March 2007. He described the two computer-generated characters in the video clip of the title track as being "like twins", one female, one male. The album is supposed to describe the different stages of a loving relationship, and explores the idea that the length of such relationships is unpredictable. Its release demonstrated a move away from virtual instruments and computers that Jarre had been using up to that point; he instead chose to use a simplified range of devices, including several new prototype instruments. The album's cover was inspired by the David Lynch film Wild at Heart. In August 2007 Jarre signed for EMI France. He released an anniversary package containing a special live recording of his classic work, Oxygène, in 3D DVD, live CD and normal 2D DVD formats in November 2007, named Oxygène: New Master Recording. A first for Jarre, the album was recorded live, without tape or hard disk playback, with help from Francis Rimbert, Claude Samard and Dominique Perrier. The album also contains three extra tracks (Variation Part 1, 2 and 3, respectively) not found on either the original or remake, which form links between the main movements. Jarre plans to integrate the original analog synthesizers from Oxygène into his next album, and is building a new private recording studio on the outskirts of Paris. In the same year Disques Dreyfus released The Complete Oxygène, containing the original versions of Oxygène and Oxygène 7–13, and remixes of tracks from Oxygène 7–13. … there are several Eminent String Machines that make up one of the main Oxygene string sounds. Having four of us meant I had to multiply the number of instruments, and finding the equipment was quite a headache, especially as I tried, as much as I could, to avoid using instruments produced after Oxygène. There are one or two exceptions but 95 percent of the instruments are of that time. For me it was really important for the radicalism of the process. Jarre performed 10 concerts (Oxygène Live) in Paris, from 12–26 December 2007, held in the Théâtre Marigny, a small 1000-seat theatre in the Champs-Élysées. Later in 2008 Jarre performed several concerts to celebrate the 30th anniversary of Oxygène, in theatres in Europe. Following one such performance at the Royal Albert Hall Jarre met Brian May, who proposed he create a concert in Tenerife for the International Year of Astronomy, but a lack of sponsorship meant that the concert did not take place. In 2009 he was selected as the artistic director of the World Sky Race, and also accepted a role as Goodwill Ambassador for the International Year of Astronomy. In 2009 he started an indoor tour in arenas throughout Europe. On 1 March 2010, Jean-Michel Jarre started the second leg of his 2009–10 Indoors tour; on 10 June, he was presented with a Lifetime Achievement Award by Mojo magazine. On 30 May 2011, Essentials & Rarities, a double-CD set, was released. This was the last Jarre work to be released by Disques Dreyfus. The Essentials disc is a compilation of some of his most famous works. The Rarities disc includes pieces recorded in the years prior to the release of Oxygène. After this release, Jarre recovered sole intellectual property rights over his work, which had previously been owned by Francis Dreyfus Music. On 1 July 2011, Jarre performed a large-scale concert in Monaco to celebrate the marriage of Prince Albert and his bride Charlene. During the last quarter of 2011 he concluded a tour schedule that had lasted for almost 3 years. He used the same format for a later concert at Carthage during the city's 2013 musical festival. In June 2013, Jarre was elected as president of the Confédération Internationale des Sociétés d´Auteurs et Compositeurs (CISAC). In Spring 2015, Jarre released the first music from a new studio album, released in October 2015, following around four years of work. The album, Electronica 1: The Time Machine (working title: E-Project), comprises a number of collaborations with other artists. The first of these to be released was the collaboration with Gesaffelstein entitled Conquistador, followed by Glory, with M83. The track was also featured as part of the soundtrack of a short film entitled EMIC. Other collaborations on the album include Zero Gravity, with the late Edgar Froese and Tangerine Dream (with a remix by Above and Beyond); Vince Clarke for Automatic (parts 1 and 2); Armin van Buuren for Stardust, John Carpenter for "A Question Of Blood", Little Boots for If..! and Pete Townshend for Travelator, Pt. 2. The album became Jarre's first album in over 25 years to make the UK Top 10 at #8. In December 2016, the album was nominated for the Grammys 2017 Awards in the "Best Dance/Electronic Album" category. In 2016, Electronica 2: The Heart of Noise was released with 15 more collaborators, including Pet Shop Boys, Hans Zimmer, Yello and Gary Numan. One track (8 "Exit") includes speech by Edward Snowden. Electronica 2 has been nominated in the Album de musiques électroniques ou dance category for the Grammy 2017 in USA & Victoires de la Musique 2017 awards in France. On 11 April 2016, it was revealed that Jarre worked in collaboration with British virtual band Gorillaz on their fifth studio album Humanz. He also composed during 2016 the soundtrack for the French news network France Info. This soundtrack, in an orchestrated arrangement, will be released as Radiophonie vol. 9 on 13 January 2017. On 30 September 2016, Jarre himself announced on Facebook a new album, called Oxygène 3, released on 2 December 2016, the 40th anniversary of Oxygène. In 2017, he performed a concert near the fortress of Masada, for the purpose of saving the Dead Sea. He also performed a special concert for the opening of the Año Jubilar (Jubilee year) at the Monasterio de Santo Toribio de Liébana, in Spain. Both concerts were heavily based in the Electronica Tour concept. During May 2017, Jarre toured in Canada and USA for the first time in his career, and in July 2017 another leg of the tour was held in Europe. During 2017, Jarre composed the musical dressing for Franceinfo. This composition was later orchestrated and released as Radiophonie vol. 9. In March 2018, Jarre performed in South America for the first time as part of his Electronica Tour in Buenos Aires and Santiago de Chile. These concerts were originally scheduled for November 2017, but problems with the production company caused the rescheduling. The 2018 leg of the tour continued in Canada and the United States during April, including the presentation of the Electronica show with a reduced track list in the Coachella Valley Music and Arts Festival. In September 2018, a studio compilation album entitled Planet Jarre – 50 Years of Music, consisting of forty-one songs in "four quite different styles of composition", was released. Jarre released his new studio album Equinoxe Infinity in November 2018. Jarre is fluent in French and English and has been married three times. He was married to Flore Guillard from 20 January 1975 until 1977; their daughter Émilie Charlotte was born in 1975 or 1976 and became a fashion model. He met his second wife Charlotte Rampling at a dinner party in St Tropez in 1976. Both were in failing marriages, and they each obtained a divorce (Rampling was married to New Zealander Bryan Southcombe). The two married, Jarre gaining custody of his daughter Émilie Charlotte, and Rampling her son Barnaby. Together they have a son, David. Jarre and Rampling separated in 1996 and divorced in 2002. He had a brief relationship with Isabelle Adjani, and married French actress Anne Parillaud in May 2005. In November 2010 the couple announced their divorce. Jarre has a half-sister Stéphanie Jarre, from Maurice Jarre's other marriages. His stepbrother, Kevin Jarre, died in 2011. Although Maurice and Jean-Michel remained estranged, following Maurice's death in 2009, Jarre paid tribute to his legacy. Jarre said about his father "My father and I never really achieved a real relationship. We probably saw each other 20 or 25 times in our lifetime. When you are able, at my age, to count the times you have seen your father, it says something... I think it's better to have conflict, or, if you have a parent who dies, you grieve, but the feeling of absence is very difficult to fill, and it took me a while to absorb that. On 5 October 2016, Jarre was announced to be part of the advisory panel of the political party Democracy in Europe Movement 2025. Place de la Concorde celebrating Bastille Day 1st entry in the Guinness Book of Records for largest outdoor concert crowd. Houston celebration of the 150th anniversary of Texas and 25th anniversary of NASA 2nd entry in the Guinness Book of Records. Paris la Defense celebration of the 200th anniversary of the French Revolution 1789–1989 3rd entry in the Guinness Book of Records. Eiffel Tower UNESCO's 50th birthday and UNESCO'S proclaimed year of tolerance Originally intended to take place at Les Invalides, but changed at short notice. Was originally announced as the first of a series of Concerts For Tolerance. Only the Paris concert took place. Giza Plateau New Millennium "The Twelve Dreams of the Sun", celebrating the 7th millennium of Egypt, and part of the worldwide celebrations for the year 2000. 1981 – Honorary member of the Beijing Conservatory of Music. 1984 – Grand Prix du Disque by L'Académie Charles Cros, for Zoolook. 1994 – Victoire de la Musique for Chronologie. 1994 – Victoire de la Musique for Europe in Concert. 1995 – Awarded Chevalier de la Légion d'Honneur from the French Government. 2006 – Polish Television Academy's "Super Wiktor" award for "Space of Freedom"
2010 – MOJO Lifetime Achievement Award. 2011 – International Cavalchina Award. 2011 – Awarded Officier de la Légion d'Honneur from the French Government. 2012 – Awarded the "Miembro Honorífico del Claustro Universitario de las Artes" (Honorary Fellow of the University Senate of the Arts) by the University of Alcalá and the Society of Artists of Spain (AIE). 2013 – Awarded the Steiger Award in Germany. 2014 – Q Innovation of Sound award. 2014 – INA Distinction Numérique Award. 2015 – GQ Man of the Year. 2017 – Roland Lifetime Achievement Award. 2017 – SPA medal of honor. 2017 – Stephen Hawking Medal for Science Communication by the Starmus Festival and Stephen Hawking. 2018 – Honorary president of INA GRM. 2018 – Honorary member of Polish Authors Society Zaiks. An asteroid, 4422 Jarre, has been named in his honour. He is an honorary citizen of Gdansk. As of 2004, Jarre had sold an estimated 80 million albums. Jarre composed for movies and also participated in documentaries. Rendezvous 2 was used in the background and also as the theme instrumental song of the Hindi movie AGNEEPATH released in 1990 where Jarre was appropriately credited. ^ Sleeman, Taylor & Francis 2003, p. 809. ^ a b "Jean-Michel Jarre.com". ^ "Latest Big Music News, Features & Stories | MOJO". Mojo4music.com. 20 January 2014. Archived from the original on 14 February 2013. Retrieved 26 January 2014. ^ Jean-Michel Jarre: "Il n'y a pas d'un côté les bad guys du web, de l'autre les artistes victimes"
^ "Gesaffelstein & Jean-Michel Jarre Collaborate For 'Conquistador'". Harder Blogger Faster. 20 April 2015. Retrieved 21 April 2015. ^ Jean-Michel Jarre (10 July 2015). "The Pre-order for my new album is finally here!". Jean-Michel Jarre. ^ "Jean-Michel Jarre : un album à l'horizon après hurt and d'absence" (in French). Archived from the original on 2 April 2015. ^ "Jean-Michel Jarre on Twitter". ^ "Jean-Michel Jarre – Timeline – Facebook". ^ "Jean-Michel Jarre Teams With John Carpenter". 3 August 2015. ^ "Jean-Michel Jarre lädt zum Gipfeltreffen der Elektro-Szene" (in German). ^ "Grammys 2017: The Full Nominations List". Retrieved 7 December 2016. ^ Alexis Petridis (15 April 2016). "Jean-Michel Jarre records with Edward Snowden – after the Guardian brings them together". London, United Kingdom: The Guardian. Retrieved 18 April 2016. ^ "32e Victoires de la musique : la liste des nominés est connue". Retrieved 10 January 2017. ^ Young, Alex. "Work is well underway on Gorillaz's new album". Consequence of Sound. Consequence of Sound. Retrieved 13 April 2016. ^ Galbraith, Alex. "Gorillaz Tease Their Latest Foray Into The Studio And A New Album". Uproxx.com. Uproxx. Retrieved 13 April 2016. ^ "JAMIE HEWLETT TEASES GORILLAZ STUDIO FOOTAGE". Diymag.com. DIY Magazine. Retrieved 13 April 2016. ^ "Le nouveau logo de France Info". BLOG.lenodal.com (in French). Retrieved 28 August 2016. ^ "Radiophonie Vol.9" (in French). ^ "Jean-Michel Jarre to play anti-Donald Trump Dead Sea concert". The Guardian. 3 April 2017. Retrieved 18 April 2017. ^ "La música de Jean-Michel Jarre hipnotiza a Liébana" (in Spanish). ^ "Jean-Michel, François, Mélanie et les autres …" (in French). ^ "Jean-Michel Jarre: "Hacer música es como cocinar"". La Nación (in Spanish). 22 March 2018. ^ "Jean-Michel Jarre: la gran sinfonía espacial" (in Spanish). 28 March 2018. ^ "Jean-Michel Jarre y su cancelación en Chile y Argentina: "Fenix Entertainment Group no cumplió con los plazos"" (in Spanish). ^ "Official website of Jean-Michel Jarre". ^ "Electronic Music Titans Jean-Michel Jarre And The Crystal Method In Conversation". Forbes.com. Retrieved 26 March 2018. ^ "Leading activists, artists, scholars and political figures take central role in DiEM25". opendemocracy.net. 5 October 2016. Retrieved 5 October 2016. ^ Jean-Michel Jarre: Making the Steamroller Fly In this bonus feature included with Jean-Michel Jarre's Oxygene Moscow VHS/DVD, director Aubrey Powell documents the legendary artist. ^ "Egyptian court OKs pyramid party". BBC News. 28 December 1999. Retrieved 22 August 2018. ^ "Polonia: independencia con incidentes". Orbe.perfil.com. 11 January 2010. Archived from the original on 2 February 2014. Retrieved 26 January 2014. Wikimedia Commons has media related to Jean-Michel Jarre.